Legend has it that in the 40’s, one Hazel Oberhelman penned an ode to Leelanau. Officially named the “Leelanau Theme Song,” but perhaps known best by its refrain—“Leelanau, Leelanau, land of delight”—it was sung by a choir of summer residents round the Lake Leelanau shore at the close of every season. These days, the Leland Country Club keeps the tradition with a public singalong every Sunday night in summer. But what will get a Leelanau lover through the rest of the year? 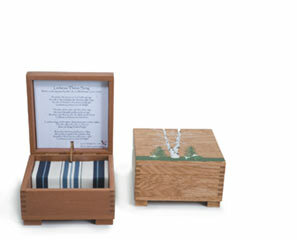 Try a made-in-Leland music box that sweetly tinkles the whole song. Choose from mahogany, cherry, poplar or oak; hand-painted or plain; small or large. Land of Delights, Leland, 231-256-9133.